Help your little one reach for a bit of independence and learn to spell his or her name too. Each letter is brightly colored with non-toxic paint and has smooth easy to fit edges. Made in the USA. Available in primary, jewel, or pastel colors. These stools are 8 inches high, 9 inches wide and 12 to 18 inches in length depending on the letters in the name. Up to 12 letters per name. Single name only, for double names please order one of our double name stools. Also available in white. The perfect keepsake stool. Name and birth date all in one. Also available in natural. Included is a complimentary gift card. Simply specify during checkout what you would like the card to say. 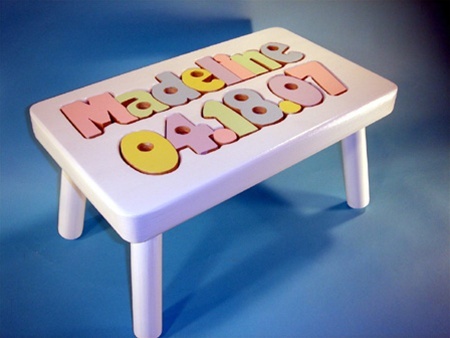 We can also send the message to the recipient via email to let them know that you have ordered a lovely stool for them. To make your stool a keepsake to treasure for years, have that special message engraved on the bottom of the stool for an additional $9.95. Please limit your message up to 6 lines and no more than 30 letters per line. The lettering size may vary according to the length of the message. To see a sample click on the larger image. Gift wrap not available for this item. These items are custom made and take approx 3 to 4 weeks to complete..
Help your little one reach for a bit of independence and learn to spell his or her name too with the birthday and name puzzle stool. Each letter is brightly colored with non-toxic paint and has smooth easy to fit edges. Made in the USA. 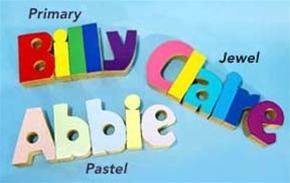 Available in primary, jewel, or pastel letter colors. 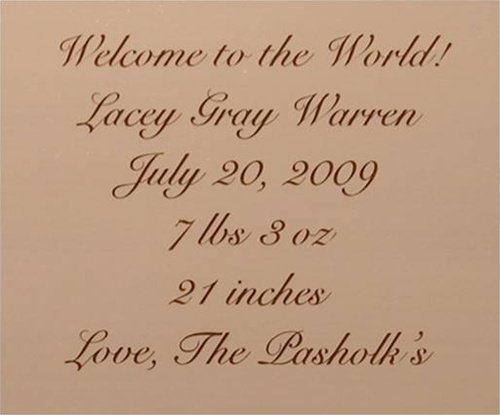 Measures 7 ¾" x 14" x 8" to fit names from 1 to 5 letters, 7 ¾" x 16" x 8" to fit names from 6 to 8 letters, and 7 ¾" x 18"-20" x 8" to fit names from 9 to 12 letters. Single name only, for double names please order a double name puzzle stool. This birthday and name puzzle stool has the birthdate in puzzle pieces under the name. Also available in natural. Included is a complimentary gift card. Simply specify during checkout what you would like the card to say. 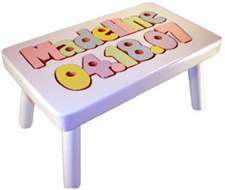 We can also send the message to the recipient via email to let them know that you have ordered a lovely stool for them. To make this wooden white kids step stool a keepsake to treasure for years, have that special message engraved on the bottom of the stool for an additional $9.95. Please limit your message up to 6 lines and no more than 30 letters per line. The lettering size may vary according to the length of the message. To see a sample click on the larger image. Gift wrap not available for the wooden white kids step stool. These are great gifts - and I so enjoy ordering them for grandkids & great nieces & great nephews. Years ago my mom got them for my kids. The quality of Tiny Keepsakes is so much better. For our son, we were gifted a wood stoool with standard colors. Been most useful gift we received and still used it to this day to brush teeth, etc. Our daughter now old enough to use her brother's everyday, so we bought the white stool with pastel lettering for her. She loves having her own and now both get used daily - with no fighting either!